* Not to be confused with the Arminian theological position of 17th cent. Europe. The modern nation of Armenia was in the news in recent years because of a terrible earthquake in 1988 and a drawn-out war with the Muslims of neighboring Azerbaijan. 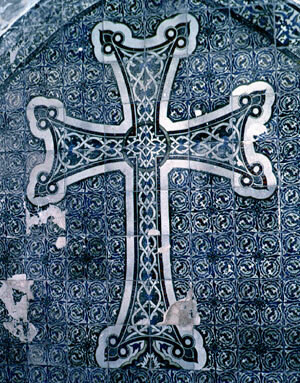 The Armenians were the first nation in the world to become a Christian nation, in about 300 AD. Soon after, Armenians started trickling into Jerusalem, where a sizeable community remains today. The Armenian quarter of the city includes most of the Western Hill (the ancient Upper City), once dominated by the extravagant palace of Herod the Great with its fountains, gardens, and tame pigeons (Josephus, Wars 4:176-181). Here Herod pressed the wise men for information about the infant Messiah. Many years later, its courtyard is probably where Jesus was condemned by Pontius Pilate. * Today, the site of the palace is occupied by an Armenian school. * Here rather than at the traditional site at the Antonia Fortress on the other side of town. Herod's Western Palace has the advantage over the traditional site of being built on a paved platform that may be the Lithostratos (the "pavement") where Jesus was condemned (John 19:13). * Buyuk Agri Dagi in modern Turkey, near the border with Eastern (Modern) Armenia. Western Armenia was conquered by the Turks in 1514. Most Armenians were killed or expelled from the area between 1915 and 1923 when more than a million Armenians were killed by the Turks (the Armenian Holocaust). 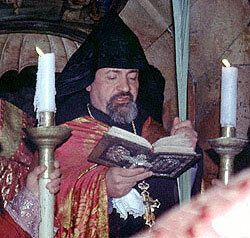 The distinctive pointed headpiece of the Armenian monks rises up above their heads like a tiny mountain, said to represent Mt. Ararat. ** The Bible says that Noah's ark landed in the "mountains of Ararat." Aramaic and Syriac translations of Genesis place the ark in the mountains of Kurdistan, southeast of the modern Mt. Ararat. The rabbis placed it in the Cordyene mountain range in the same region (Gen. Rab. 33:4). But the Babylonian Gilgamesh epic, in which the hero, Gilgamesh, journeys into the mountains to search for Utnapishtim, the Babylonian Noah, places Utnapishtim at "the source of the rivers," i.e. the Tigris and Euphrates, back up in the area of modern Mt. Ararat (Tablet XI:190-200). Gilgamesh seeks from Utnapishtim the secret of eternal life, since he is remembered, as is the Biblical Noah, to have lived long after the Flood. The Armenians say that it used to be the custom among them that when a boy turned 13, his father would take him up Mt. Ararat to show him the ark. * This must have been quite an adventure. Mt. Ararat is 16,854 ft in height (5,185 m), one of the 25 tallest mountains in the world. Its upper slopes are covered with snow all year long. Many believe that today the ark is buried in the snow or in the glacier on the north side near the summit. * As in the time of the New Testament, when Josephus claims the remains of the ark could be seen (Antiquities 20.25). * Philo, Mos. 2,65; 1 Clement 9:4. * This is quite different than the currently popular Christian teaching of a Millennium peopled with unbelievers that survive the coming of Messiah. The parallels between Noah and Jesus are many: "Noah" means the "one who will give us rest" (Gen. 5:29). One of the names of the Messiah is "Peace" (Micah 5:5; or the "Prince of Peace," Isa. 9:6). Both bring that peace by means of a worldwide catastrophe that destroys the unrighteous and renews the world for a faithful remnant (Heb. 11:7). And through both, God offers to enter into a covenant relationship with all mankind (Gen. 9:9,12; Isa. 49:6). The covenant established with Noah was to be an eternal covenant with all his descendants: "for all generations to come" (Gen. 9:9,12). * Although neglected by later Christian theology, with its supersessionist view of the Biblical covenants, the continuity of this and every other Biblical covenant is clearly affirmed in Galatians when Paul, speaking of the covenants of Moses and of Abraham, says that a later covenant "does not invalidate a covenant previously ratified by God" (Gal. 3:17). This applies to all the covenants of the Bible, including the covenant of Noah. * Literally, "for eternal generations." The covenant of Noah places three divine commands on mankind. (1) "Be fruitful and multiply": a repetition of the first command given to Adam and Eve in the Garden of Eden (Gen. 9:1; 1:28). (2) "Every moving thing will be food to you": which gives permission to eat meat, forbidden or unnecessary before the Flood (Gen. 9:2-3; 1:29). This comes with a qualification attached: "surely flesh with its life, its blood, you will not eat" (Gen. 9:4), prohibiting the eating of blood. (3) "I will require your lifeblood from every animal...and from every man" requires a punishment of death for murder. This penalty is to be enforced by man himself: "whoever sheds man's blood, by man his blood will be shed" (Gen. 9:5,6). * Jubilees, first written in Hebrew, was preserved in ancient Ethiopian by the Ethiopian Church. Fragmentary copies exist in Latin, Syriac, and in Hebrew among the Dead Sea scrolls. The final list of the Laws of Noah accepted by the rabbis is closer to Genesis 9: (1) no idolatry, (2) no sexual immorality, (3) no bloodshed (Gen. 9:6), (4) no robbery, (5) no eating of flesh cut from a living animal (i.e. with the blood still in it; Gen. 9:4), (6) no blasphemy, and (7) the duty to establish courts of law (derived from the requirement to punish murderers in Gen. 9:6). * But here, too, there are laws not mentioned directly in the Biblical account. 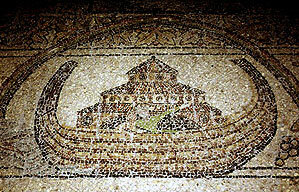 * The two final laws (#6 and #7) were disputed by the rabbinical School of Manasseh, which attempted to more closely derive the Laws of Noah from Gen. 9 and surrounding chapters. They proposed to replace them with the prohibition of emasculation (related to the commandment to be fruitful and multiply, Gen. 9:1,7) and the prohibition against crossbreeding different kinds of plants and animals. But this and a later attempt to connect the seven laws of Noah with Gen. 2 were introduced after the final list had already been established. * Also included among these laws are commandments for Gentiles to cleanse themselves from the ritual impurity of contact with the dead (Num. 19:10, as in the list in Jubilees), to observe the Day of Atonement (Lev. 16:29) and the Days of Unleavened Bread (Ex. 12:19; although not the Passover meal itself, Ex. 12:48,49), and to observe certain regulations when offering burnt offerings to God (Lev. 17:8, 22:18; Num. 15:14). Additional regulations in this same category concern Gentiles actually living in Jewish cities (ger ha-shaar), who were to rest on the Sabbath (Ex. 20:10, Deut. 5:14) and celebrate the Feast of Tabernacles (Deut. 16:11,14). But these additional laws were interpreted by the rabbis to apply only to proselytes (converts to Judaism), and not to Gentiles in general. *Though the rabbis require that this commitment be made before a Jewish religious court to be valid. In the time of Jesus, the Laws of Noah were controversial. Some felt it was better for Gentiles to become proselytes (converts to Judaism), as in the time of the Maccabees, when Gentiles were converted to Judaism by force. * These differing points of view can be seen in the case of Izates, the king of Adiabene (in what is today Iraq), who was convinced of the truth of the Jewish religion in about 40 AD. One Jewish teacher discouraged him from being circumcised (converting to Judaism), another pressed him to do so (Josephus, Antiquities 20.2.3-4). * The Edomites (Idumeans) were forcibly converted by the Maccabean king John Hyrcanus. Later, especially after Christianity came to power, the number of proselytes declined. Conversion to Judaism came to be discouraged by the rabbis for fear of insincere converts, as it often is today. A similar division fueled the debate in the early Church over Gentile believers. This disagreement, which led to sharp words between Peter and Paul in Antioch (Gal. 2), was the reason for the Council of Acts 15. Pharisees that had accepted Jesus argued that Gentile believers must be circumcised (that is, converted to Judaism) with the obligation of observing the Law of Moses (Acts 15:5). Against them, Peter, Paul, and Barnabbas argued that the "yoke" of the Law should not be put on Gentile believers, whom God had accepted independent of the Law (Acts 15:10-13). * In the end, the Council anticipated the position soon agreed on by the rabbis: that Gentiles can be accepted by God without conversion to Judaism. * Peter waffled on this topic earlier at Antioch (Gal. 2), but by the time of the Council came down strongly on Paul's side. That the Council was thinking along the same lines as the rabbis can be seen from their decision, which laid only three requirements on Gentile believers: to avoid (1) idolatry, (2) sexual immorality, and (3) what is strangled (meat with the blood still in it), including blood (Acts 15:20). These are three of the Laws of Noah! But why did the Council mention only these three laws and not all seven? Some have suggested they were the requirements that most directly affected table fellowship, which was in large measure the source of the conflict. Another possibility is that the other Laws of Noah were already accepted by the Gentile world: the Romans recognized that murder and robbery were wrong, and had set up courts to deal with such crimes. The prohibition of blasphemy was likely considered unnecessary, as the rabbis ruled that blasphemy only took place with the actual name of God (YHWH), the pronunciation of which had become a closely guarded secret, known only to the priests. That left just three of the Laws of Noah that needed to be affirmed: the prohibition of (1) idolatry, (2) sexual immorality, and (3) eating blood and flesh with blood in it, the same three things commanded by the Council of Acts 15. If Gentile believers keep themselves "free from such things," the Council ruled, "you will do well" (Acts 15:29), and do not need to observe the rest of the Law of Moses ("It seemed good to the Holy Spirit and to us to lay on you no greater burden"; Acts 15:28). * The Council of Acts 15 accepted Amos' prophecy of the restoration of the tabernacle of David as the basis for its decision (Acts 15:15-18). This prophecy recalled a time when many in David's kingdom were not Jews and were not subject to the Law of Moses (Arameans, Ammonites, Edomites, and others). Yet all came under the kingly rule of David. In the same way, not all in the kingdom of Messiah are subject to the Law of Moses, yet all come under the royal authority of King Messiah. Unfortunately, most Christians have never heard of the Laws of Noah, and are not aware of the position that Gentiles occupy in the religious thinking of the Jews--including that of the early Jewish Christians in the New Testament. As a result, when Gentile believers begin to learn about the Jewish Roots of the Christian faith--that we have been grafted into Israel (Rom. 11:17) and are fellow citizens with the Jewish believers in Jesus (the "saints" or holy ones; Eph. 2:12,19)--many assume this implies the necessity of obedience to the Law of Moses in some way. This includes the many groups that forbid eating pork, for example, or who insist that Gentiles must rest and/or worship on the Biblical Sabbath (Saturday Sabbath). The strange thing about these Gentile opinions is that even the rabbis themselves don't consider obedience to such things necessary--or even desirable--for Gentiles. Many are, in fact, forbidden for Gentiles to do (as also stated on some points in the Law of Moses itself). * Paul reacted strongly to those who advocate obedience to the law by Gentile Christians. "Having begun by the Spirit, are you now being perfected by the flesh?" (Gal. 3:3; i.e. by the works of the Law, Gal. 3:2,5). * The Biblical Sabbath has been taught as a legal requirement by several Christian groups because of its inclusion in the Ten Commandments. This is because, in Christian theology, the Ten Commandments have often functioned as an alternative to the long-forgotten Laws of Noah. (Five of the Laws of Noah can be found in the Ten Commandments.) But, curiously, observing the Sabbath is not included in any of the Jewish formulations of the Laws of Noah, including Acts 15. Sabbath observance was considered by the Jews--including the early Jewish Christians--to be a requirement for Jews alone (Rom. 14:5). * We're talking here, of course, primarily about the ritual and ceremonial commandments of the Law of Moses. The great moral commands are included in and required by the Law of Messiah (the New Testament) of both Jewish and Gentile believers in Jesus. This is because these primarily ritual and ceremonial commands of the Law, though having an important role and function in pointing to the Messiah, are in themselves ineffective against the flesh (Col. 2:23). Not only that, they can become a trap, convincing us that we are progressing in holiness, when in fact we are going backwards, away from the things of the Spirit and towards the works of the flesh (Gal. 3:3). Only the Spirit of Messiah, working through the Law of the Messiah, can bring us victory (Rom. 8:2)! Paul's teaching on this topic has often been misinterpreted as a rejection of the Law of Moses as a whole. But in fact, Paul's position derives directly from the Law, in agreement with the rabbis after him. Paul and the rabbis agreed (as mentioned above) that Gentiles are excluded from the requirement of obedience to the Law on the basis of instructions found within the Law itself. In other words, Gentiles are excluded from the Law of Moses in obedience to the Law of Moses. Gentiles have their own Law--the Laws of Noah--and their own relationship to God through that Law,* which is not to be confused with the Law of Moses. * In addition to their obedience to the Law of Messiah, as Christians. But this left a big question unanswered: If it is possible to be right with God through the Laws of Noah, why was the Law of Moses necessary at all? Paul found the answer in his faith in Jesus, who fulfills everything these earlier covenants point to. The Law of Moses is a guardian--literally a "child-conductor"--to lead the Jewish people to Messiah, through whom the rest of the world has learned of him (Gal. 3:24, John 4:22). The purpose of the Law is therefore to point to Messiah, a function that it continues to fulfill today (Rom. 10:4). * But the fullness is in Messiah alone (Col. 2:17). * Messiah is the "goal" of the Law, not the "end" of the Law as this verse is often misleadingly translated. How can Jesus be the Messiah? The "Three Exceptions": Theological necessity or practical concession? Click here to return to the On-line Classroom. Updated 12/17/06. Copyright © 2000, 2001, 2006 by Jeffrey J. Harrison. All rights reserved. Photos by the author. Please do not copy without permission.